Turn on the 4K Projector. Use the arrow buttons on the remote control to select MENU. At the MENU screen, use the arrow buttons to select the Information icon. The firmware version currently installed will be listed on the screen. If the version number is 1.202 or higher, you do not need this update. If the version number is lower than 1.202, you should install this update. Do not operate, power off, or disconnect the 4K Projector from the AC power outlet until after the update is complete. Failure to follow the instructions, or an interruption in the update process, may cause the projector to become unresponsive or to require repair. Download the sony_pjupdate_2013_1202_pjb_auth.zip file to a temporary or download directory (please note this directory for reference). Extract the update folder from the sony_pjupdate_2013_1202_pjb_auth.zip file. Connect a USB storage device to your computer. Copy the sony_dtv0FA30A07A0A7_00012900 extracted folder to the root directory of your USB storage device. Note: The root directory is the top directory in a file system. IMPORTANT: Do not change the name of the folder or copy to any other folder on the USB device. This update will not install successfully if the name of the folder is modified or if the folder is not copied to the root directory of the USB device. For Windows operating systems: Right-click the sony_dtv0FA30A07A0A7_00012900 folder and, from the menu, click Send To..., and then click the drive (EX: Removable Disk E:) that represents your USB device. The update folder will be copied onto your USB storage device. 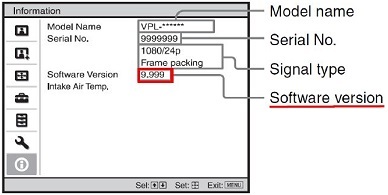 For Mac OS X operating systems: Drag and drop the sony_dtv0FA30A07A0A7_00012900 folder to the root folder of the USB storage device. After copying the sony_dtv0FA30A07A0A7_00012900 folder is completed, remove the USB device from your computer and continue to the next section. IMPORTANT: Please do not remove the USB storage device until instructed to do so. Make sure no other USB device is connected to the projector before starting the update. Insert the USB storage device containing the update folder into USB port of the projector. Turn on the projector. The update process starts automatically. Note: The ON/STANDBY indicator will blink green and then amber during the update process. The update process takes about 5 minutes to complete. Once the update is complete, the ON/STANDBY indicator will light up red, and the projector will enter Standby Mode. Note: After the update, the initial power on takes about 15 minutes to light the laser. During this period, the ON/STANDBY indicator will blink green and the fan will spin at high-speed. Do not power off the projector or disconnect it from the AC power outlet. Once the projector completely starts and the laser is lit, the update process is complete. If the version number is 1.202, the firmware update was successful. If the version number isn't 1.202, download and install the update again.